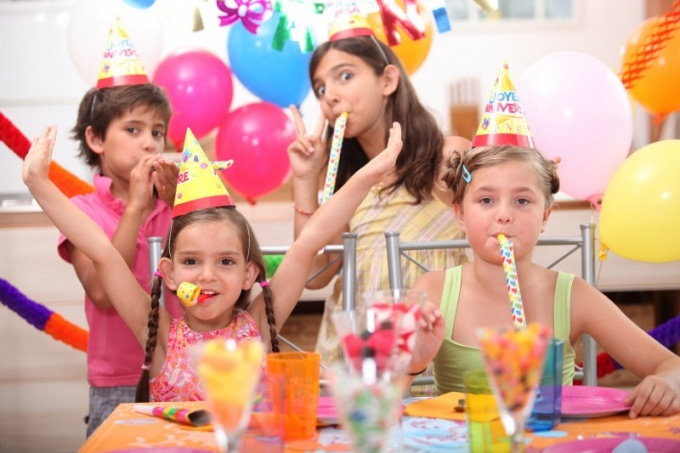 Children's birthday party – an excellent opportunity to demonstrate ingenuity and organizational skills. You can, of course, to hire professional animators, but your child is much more like a holiday made by the parents. Contests and games for children should be chosen based on the age of the participants. And be sure to alternate active games and table that children are not overtired. Children of this age are not yet ready for competitive contests, but willing to perform different actions together. Balloons. Great game for the start of the holiday, one of the adults throws on top of the balloons, and their children to catch and throw. Game will help to liberate the shy child. The throwing of snowballs. Sculpt snowballs out of paper, you can also wrap them in foil. Children throw snowballs in a bowl or bucket of popcorn, the main thing is not to make a competition for who will throw. Bubbles. Children readily catch bubbles produced by adults. Drawing finger paints. On the floor stretches a drawing paper or a roll of Wallpaper, the children are given old clothes and finger paint, fun guaranteed, at least for an hour. At this age children are willing to compete in agility, accuracy, wit, etc. Daisy. Paper pre-glued Daisy petals on which are written different funny jobs. Daisy turns the job down and the children take turns off the petals, then each must perform written. Freeze. The presenter throws up a balloon to the ceiling. While the ball is in the air, can move as soon as the ball fell, everyone must freeze. The one who first moved out of the game and the competition continues, the ball is tossed again. Sharpshooter. To the wall with tape stick balloons. Inside each ball small prize (candy, keychain). Children stand at a distance of 3 meters from the wall. Each child is given three Darts, so he could earn prizes. Crocodile. The children are divided into 2 teams. Each team in turn selects the member who the other team whispers the word says. The child chosen should gesture to show the word to his team so they guessed. Swamp. Participants again divided into two teams. Each issued 2 sheets of paper. Children one should go "swamp" getting down on one sheet, put another. Go to the second sheet, and left behind once again put in front of you, etc. If a child accidentally stepped past the sheet returns to the beginning of "the swamp." The winner is the team whose all participants will pass before the other side.